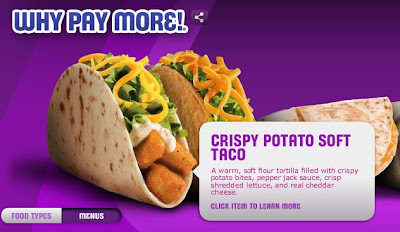 French Fry Diary: Crispy Potato Soft Taco? 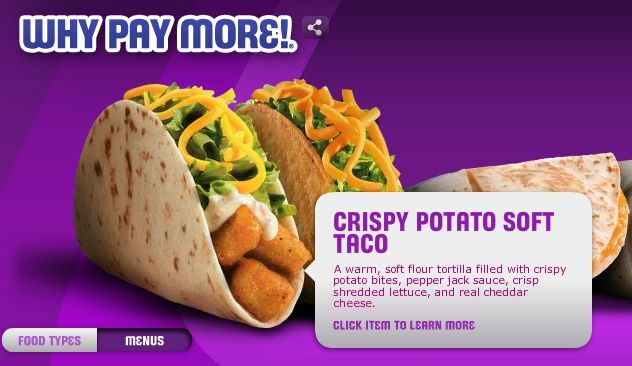 This is the Crispy Potato Soft Taco from Taco Bell’s value menu. Take a moment, get past the initial reaction of “What?” and think about it. Read the description. 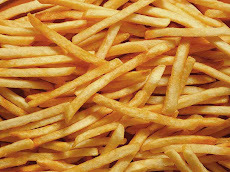 Potato bites. Jalapeno ranch. Lettuce and cheese. It’s a winning combination. The potato bites are seasoned just right, but the jalapeno ranch has an afterburn that will please anyone who likes the tangy side of life. They’re warm and soft with a crispy coating, and the mix with the ranch and the lettuce and cheese and the soft taco shell = win. And you can’t beat that they’re cheap. Even on a warm day, it’s a good snack or part of a meal. I went today, after a workout at the gym, and cashed in my coupon for a free limeade, and spent a couple bucks on this and a taco and had a nice light lunch! If they still have this in the cooler weather, it would be a great way to warm up on a cold day. Also, the limeade? Very limey. The coupon is still available at the Taco Bell website – click here – you have to print it up (make sure you have Java on your computer) and use it soon. The one I printed had an expiration date of June 1st. The above appeared in slightly different form at Terry’s blog, make sure you check it out. Thanks, man!